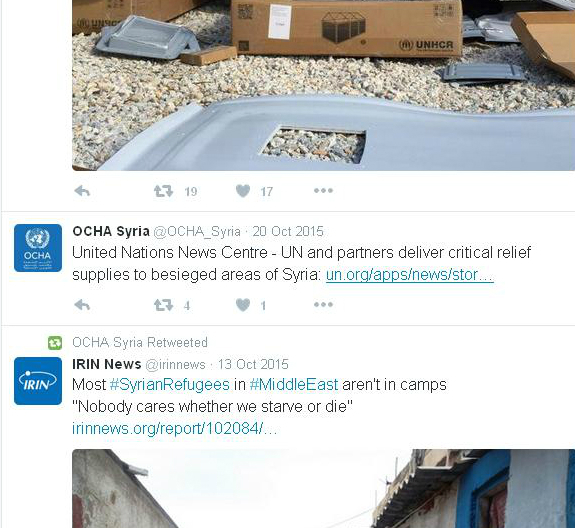 On December 28, 2015, the United Nation’s OCHA made its first express Twitter mention of two northern Syrian villages, al-Foua and Kafarya (also transliterated as Kafraya). The belated December mention is in spite of the fact that the two villages of around 30,000 people have been locked under siege by terrorist factions Jebhat al-Nusra (al Qaeda in Syria), Jaysh al-Fattah (the so-called “Army of Conquest”), and Ahrar al-Sham (Liberation of the Levant Movement), among other terrorist factions, since March 2015. The siege has meant that the isolated villages have had limited to no access to food and medical supplies since then. Additionally, terrorists have been daily firing rockets, mortars and hell cannons at the villages, killing and maiming residents, destroying homes and infrastructure. In October, 2015, the ICRC reported that al-Foua and Kafarya were among several areas to receive humanitarian assistance. The tweet-linked UN report, however, does mention at least mention the two villages by name, although it does not at all mention the terrorists’ bombings of the villages, nor the immensely dire situation there. I am gravely concerned by the ongoing fighting taking place in Idleb governorate and its possible impact on hundreds of thousands of civilians. Hillo apparently did not sustain his concern. In fact, since that March 30 statement of concern, OCHA’s twitter feed did not once mention al-Foua and Kafarya by name, although it heavily and specifically mentioned various terrorist-occupied areas, like Yarmouk, al-Waer, al-Zabadani, and of late, al-Madaya–the new Yarmouk. Frequently, when tweeting about Yarmouk, OCHA made vague reference to “fighting in Idleb” or simply tweeted the latest “Idleb Humanitarian Report.” You’d think that after the UN Resident Coordinator’s “grave concern” OCHA might have taken a stronger interest in al-Foua and Kafarya. Then again, reporting on the suffering of civilians locked-down and bombed by western-backed terrorists doesn’t serve the NATO-agenda, which the UN dances along to. Consider that the areas that the UN’s OCHA did tweet about–Yarmouk, al-Waer, Zabadani, Madaya, to name but some–are occupied by terrorists as criminal as Da’esh which the west purports to fight. All these factions are terrorists, none of them moderates. 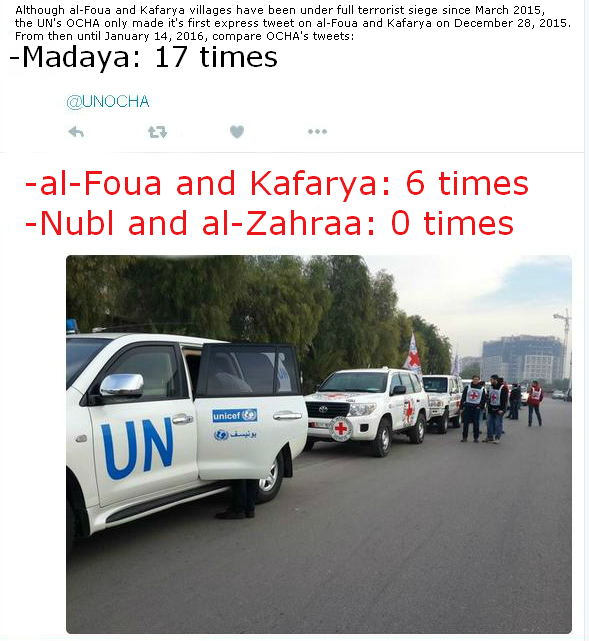 Somehow, the UN is able to visit Madaya, al-Waer… but cannot get to al-Foua and Kafarya. Defies logic. If the UN representatives are able to enter into terrorist hotbeds, they can exert pressure on the western-backed mercenaries to allow them into civilian areas surrounded by the terrorists. IF they wanted to. Which they don’t. The UN welcomes today’s approval from the Government of Syria to access Madaya, Foah and Kefraya and is preparing to deliver humanitarian assistance in the coming days. 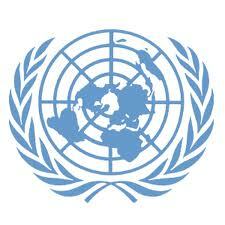 International humanitarian law prohibits the targeting of civilians. It also prohibits the starvation of civilians as a tactic of war. The Syrian government has already requested, through the Ministry of Foreign Affairs, from the office of resident coordinator of the United Nations in Syria, by its note #3746, dated 27th December, 27 December, 2015, to URGENTLY deliver humanitarian assistance, including medical assistance and fuel, to al-‪#‎Foua‬ and ‪#‎Kafraya‬, in the governorate of Idlib, and to ‪#‎Madaya‬, in the governorate of Damascus countryside. We would like to highlight that the humanitarian assistance sent to Madaya in mid-October was sufficient for two months. And this testimony was corroborated by the representative of the ICRC in Syria a few days ago. …The Syrian government aproved the requests of the resident coordinator of Unicef, WFP and ICRC to deliver humanitarian and relief assistance, including medical assistance, to Madaya, al-Foua and Kafraya, on 8 January, 2016. …The Syrian government previously approved the requests of the United Nations and ICRC to deliver humanitarian assistance to ‪#‎Zabadani‬, Madaya, al-Foua and Kafraya on 18 October, 2015. We would like to add here that some of the humanitarian assistance sent to restive areas has been looted by the armed terrorist groups on several occassions. And this is exactly what happened in Madaya and al-Zabadani. Furthermore, the Turkish authorities hindered the delivery of humanitarian assistance through the borders to other restive areas. …On October the 18th, we sent enough humanitarian assistance for more than 2 months, and the representative of the ICRC corroborated this 2 days ago on Syrian TV saying that there is no starvation problem in Madaya. Regarding the UN’s January 7 statement which includes “International humanitarian law prohibits the targeting of civilians. It also prohibits the starvation of civilians as a tactic of war,” it is thus baffling that since the March 2015 full-siege on al-Foua and Kafarya, the UN’s OCHA neglected to tweet about the near-daily terrorist bombings of those villages’ citizens, nor the starvation-by-siege of Kafarya and al-Foua residents. The narrative the UN and like agencies, and corporate media, put forth regarding Madaya, and the Yarmouks before Madaya, is one which obfuscates on the suffering caused by western-backed terrorism, and inflates stories of civilians’ suffering in terrorist-hotbeds. It is a false narrative that pulls heartstrings of well-intentioned but less-informed readers who believe in the (long-aog-shot) credibility of the UN. Although there is indeed suffering in places like Madaya, the civilians themself have said what the cause is: the terrorist factions within stealing aid and goods and selling at extortionist rates. -Foua/Kafarya residents are lacking food and medicines due to the siege of western-backed terrorists; any shortage of goods in Madaya is due to the theft and mafia-esque extortions of terrorists infesting Madaya. Of course, there are areas other than al-Foua, Kafarya, Nubl, Zahraa which are suffering immensely due to terrorist attacks and siege, and which get little or no UN tweetage…But given the current media campaign regarding Madaya, I am looking here just at the discrepencies in the UN’s focus on the two areas. The UN and so-called “humanitarian” groups/agencies will not tweet or speak the truth of the massive suffering in al-Foua and Kafayra, much less of the long-suffering of the people of Nubl and Zahraa and everywhere else terrorized by NATO’s mercenaries. Therefore we must, and we must continue to reveal the deceptions and not-even-slick propaganda at play, as well as to recognize that the timing is not coincidental. …whenever there is a step forward towards a political solution in Syria, certain incidents are fabricated to de-fame the Syrian government and to negatively impact the political process…. Now, and when the Syrians are going to meet in Geneva, end of this month, certain regional and international parties supporting terrorism in Syria are not satisfied that the Syrian government is engaging positively in the political process. And thus are trying to demonize it…torpedoing the meeting in Geneva. The Western news media are the propaganda arm of the state-sponsored terrorist assault on Syria….The plain truth is that people in Syria are being held siege by Western-orchestrated terrorists. …A siege of another kind is also being forced on the minds of the Western public by the Western media; it involves starving them of the truth. Cunningham is absolutely correct. And the UN is just as complicit in the lies, the manipulation of facts, the whitewashing of terrorists in Syria, and in the obfuscation of true suffering at the hands of said-terrorists.